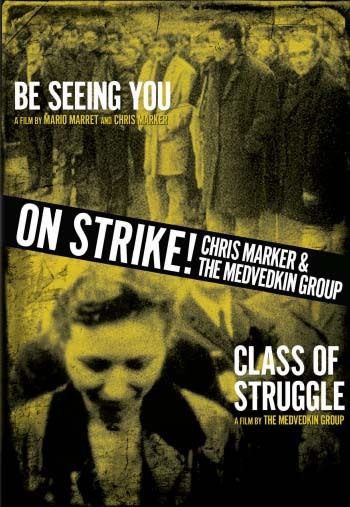 In 1967, Chris Marker and Mario Marret filmed BE SEEING YOU (À BIENTÔT J’ESPÈRE), about a strike and factory occupation-the first in France since 1936-by textile workers in the city of Besancon, the goals of which were unusual because the workers refused to disassociate their salary and job security demands from a social and cultural agenda. In response Marker and his colleagues reorganized their efforts, and began training workers to collaboratively make their own films, under the name “The Medvedkin Group”, after Alexander Medvedkin, who invented the cine-train, a mobile production unit that toured the USSR in 1932 filming workers and farmers. CLASS OF STRUGGLE, their first film, picks up a year later and focuses on the organizing efforts of workers at a nearby watch factory, particularly the story of one recently radicalized woman, Suzanne Zedet. She articulates the radical scope of the workers’ demands, which include access to the tools of cultural production. Thanks and bravo Icarus Films!